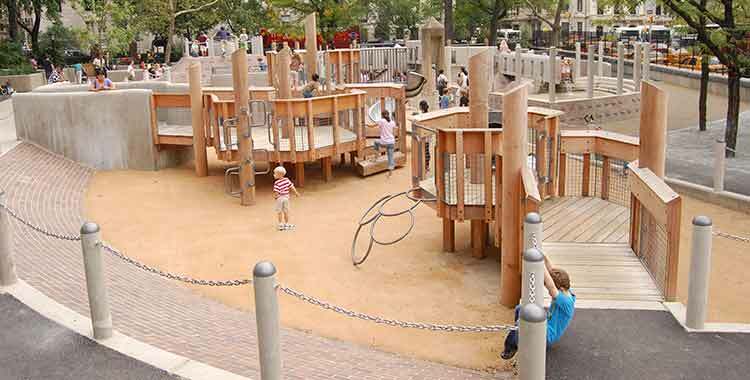 Despite its name, Ancient Playground is one of the Park's most recently reconstructed playgrounds. Just north of the Metropolitan Museum of Art, the playground's climbing pyramids, obelisk and sundial were inspired by the museum's collection of Egyptian Art. In the main play area, pyramid-shaped climbers with slides and tunnels are linked by concrete bridges. Additional wooden climbers are ideal for older children who love to climb and explore. For younger children, the playground has an obelisk-shaped structure set in a sandbox. Bucket, tire and strap swings accommodate children of all ages. Ancient Playground has two user-activated water features. One is integrated into the main climbing structure: water runs from a central obelisk across two bridges and cascades like a mini-waterfall into an open area with water jets. The other is a small semi-circular area for younger children with spray nozzles set into a wall. Central Park Conservancy reconstructed Ancient Playground and the comfort station in 2009. As part of this work, the Osborn Gates were restored and reinstalled at the entrance to the playground. Designed by Paul Manship, the bronze gates depict stories from Aesop's Fables. They were originally built in 1953 and installed at a nearby playground, but were removed in 1972 after being vandalized, and had remained in storage for over 30 years.